We are a small Bonsai club with members of all abilities from the Fenland, West Norfolk, North Cambridgeshire and South Lincolnshire areas. 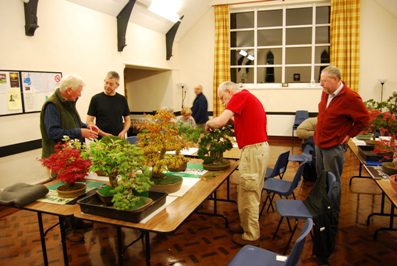 Our aim is to further the development of Bonsai in the area by passing on the experience gained by our members over many years to anyone who is interested in the hobby. Our meetings have a monthly theme which can be found on our web site, but meetings are informal and any topical subject is covered, and designed to be of interest, whatever your level of experience in the hobby. We also hold full day workshops with a world renowned Japanese tutor and several social events throughout the year. Membership open to anybody and the monthly meetings are held at Newton Village Hall on the third Friday of every month. Full day workshops with professional tutors are held at Silverwood Garden Centre, Long Sutton.